Mason, T. David and Sara McLaughlin Mitchell. 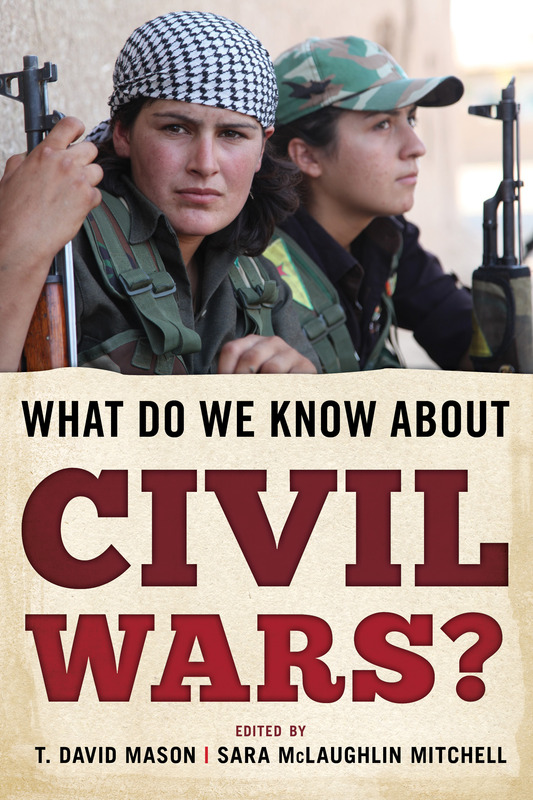 What Do We Know About Civil Wars? Rowman & Littlefield Publishers, May 2016. See the R&L website for more information. Harrison, Ewan and Sara McLaughlin Mitchell. 2013. The Triumph of Democracy and the Eclipse of the West. Palgrave McMillan. See the Palgrave website for more information. Mitchell, Sara McLaughlin and John A. Vasquez. 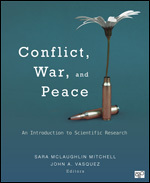 Conflict, War, and Peace: An Introduction to Scientific Research. 2013. CQ Press/Sage. See the CQ Press website for more information. Check out an interview related to this book here. Mitchell, Sara McLaughlin, Paul F. Diehl, and James D. Morrow (editors). 2012. 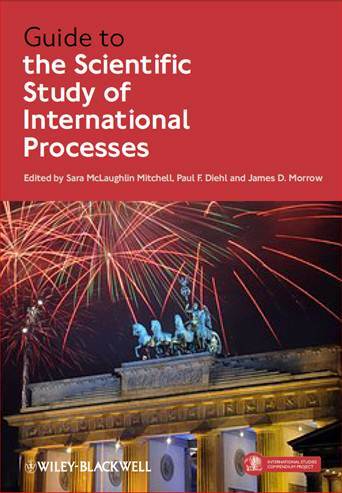 Guide to the Scientific Study of International Processes. West Sussex, UK: Wiley-Blackwell. See the Wiley website for more information. All proceeds from the sales of this book go to the Scientific Study of International Processes (SSIP) section of ISA. Mitchell, Sara McLaughlin and Emilia Justyna Powell. 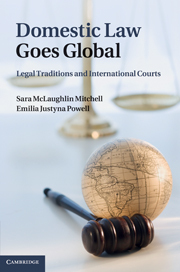 Domestic Law Goes Global: Legal Traditions and International Courts. Cambridge University Press (2011). See the Cambridge website for more information. Lee, Sojeong and Sara McLaughlin Mitchell. 2019. "Energy Resources and the Risk of Conflict in Shared River Basins." Journal of Peace Research. Dion, Michelle L., Jane L. Sumner, and Sara McLaughlin Mitchell. 2018. "Gendered Citation Patterns across Political Science and Social Science Methodology Fields." Political Analysis 26(3): 312-327.. See also the Appendix for the paper and the replication materials. Daniels, Kelly and Sara McLaughlin Mitchell. "Bones of Democratic Contention: Maritime Disputes. "International Area Studies Review 20(4): 293-310. Mitchell, Sara McLaughlin and Christopher Achen. 2018. "Shifting Standards for Political Methodologists? Historical Trends in the Society for Political Methodology. "PS: Political Science & Politics 51(3): 574-579. Claypool, Vicki Hesli, Brian David Janssen, Dongkyu Kim, and Sara McLaughlin Mitchell. 2017. "Determinants of Salary Dispersion among Political Science Faculty." PS: Political Science & Politics 50(1): 146-156. Review of our findings in Inside Higher Education. Hensel, Paul R. and Sara McLaughlin Mitchell. 2017. "From Territorial Claims to Identity Claims: The Issue Correlates of War (ICOW) Project." Conflict Management and Peace Science 34(2): 126-140. Mitchell, Sara McLaughlin. 2017. "Dangerous Bargains with the Devil? Incorporating New Approaches in Peace Science for the Study of War." Conflict Management and Peace Science 34(1): 98-116. Anderson, Christopher C., Sara McLaughlin Mitchell, and Emily Schilling. 2016. "Kantian Dynamics Revisited: Time Varying Analyses of Dyadic IGO-Conflict Relationships." International Interactions 42(4): 644-676. Replication files for data1, data2, read me file, and command files. Mitchell, Sara McLaughlin and Neda A. Zawahri. 2015. "The Effectiveness of Treaty Design in Addressing Water Disputes." Journal of Peace Research 52(2): 187-200. Replication files available here. Hensel, Paul R. and Sara McLaughlin Mitchell. 2015. "Lessons from the Issue Correlates of War (ICOW) Project." Journal of Peace Research 52(1): 116-119. Nemeth, Stephen C., Sara McLaughlin Mitchell, Elizabeth A. Nyman, and Paul R. Hensel. 2014. "Ruling the Sea: Managing Maritime Conflicts through UNCLOS and Exclusive Economic Zones." International Interactions. 40(5): 711-736. Replication data available here. Mitchell, Sara McLaughlin. 2014. "Mediation in Interstate Disputes." International Negotiation 19(2): 191-200. Mitchell, Sara McLaughlin and Peter F. Trumbore. 2014. "Rogue States and Territorial Disputes." Conflict Management and Peace Science 31(3): 323-339. Click here for the STATA replication files. Mitchell, Sara McLaughlin, Samantha Lange, and Holly Brus. 2013. "Gendered Citation Patterns in International Relations Journals." International Studies Perspectives. 14(4): 485-492. Mitchell, Sara McLaughlin and Vicki L. Hesli. 2013. "Women Don't Ask? Women Don't Say No? Bargaining and Service in the Political Science Profession." PS: Political Science & Politics 46(2): 355-369. Click here for the article's appendix. Mitchell, Sara McLaughlin, Jonathan J. Ring, and Mary K. Spellman. 2013. "Domestic Legal Traditions and States' Human Rights Practices." Journal of Peace Research 50(2): 203-217. Replication files are available here. Hesli, Vicki L., Jae Mook Lee, and Sara McLaughlin Mitchell. 2012. "Predicting Rank Attainment in Political Science: What Else Besides Publications Affects Promotion?" PS: Political Science & Politics 44(2): 393-408. Mitchell, Sara McLaughlin and Paul F. Diehl. 2012. "Caution in What You Wish For: The Consequences of a Right to Democracy." Stanford Journal of International Law 48(2): 33-62. Mitchell, Sara McLaughlin and Cameron G. Thies. 2012. "Resource Curse in Reverse: How Civil Wars Influence Natural Resource Production." International Interactions 38(2): 218-242. Lee, Hoon and Sara McLaughlin Mitchell. 2012. "Foreign Direct Investment and Territorial Disputes". Journal of Conflict Resolution 56(4): 675-703. Download the paper here , the data files for ICOW and Huth & Allee, and the do files for ICOW and Huth and Allee here. Analysis including other systemic variables can be found here. Click here for the data appendix. Mitchell, Sara McLaughlin. 2012. "Norms and the Democratic Peace." Pages 167-188 in John A. Vasquez (ed. ), What Do We Know About Interstate War? Rowman-Littlefield. Order here. Mitchell, Sara McLaughlin and Cameron G. Thies. 2011. "Issue Rivalries." Conflict Management and Peace Science 28(3): 230-260. Download the paper in pdf format here. Mitchell, Sara McLaughlin and Paul R. Hensel. 2011. "Issues and Conflict", in Tor Georg Jakobsen(ed. ), War: An Introduction to Theories and Research on Collective Violence. Hauppauge, NY: Nova Science Publishers, Inc. Download the chapter in pdf format here. Crescenzi, Mark J.C., Kelly M. Kadera, Sara McLaughlin Mitchell, and Clayton L. Thyne. 2011. "A Supply Side Theory of Mediation." International Studies Quarterly 55(4): 1069-1094. Download the paper in pdf format here. Download the Stata dataset and replication files here. Neda A. Zawahri and Sara McLaughlin Mitchell. 2011. "Fragmented Governance of International Rivers: Negotiating Bilateral versus Multilateral Treaties." International Studies Quarterly 55(3): 835-858. Download the paper, dataset, and STATA code here. Ellis, Glynn, Sara McLaughlin Mitchell, and Brandon C. Prins. 2010. "How Democracies Keep the Peace: Contextual Factors That Influence Conflict Management Strategies." Foreign Policy Analysis 6(4): 373-398. Download the paper in pdf format here. Download the dataset, marginal effects figures, predicted probabilities, and Stata code as well. Mitchell, Sara McLaughlin and Clayton L. Thyne. 2010. "Contentious Issues as Opportunities for Diversionary Behavior." Conflict Management and Peace Science 27(5): 461-485. Download the paper in pdf format here. Replication data can be obtained here. Mitchell, Sara McLaughlin and Emilia Justyna Powell. 2009. "Legal Systems and Variance in the Design of Commitments to the International Court of Justice." Conflict Management and Peace Science 26(2): 164-190. Download the paper in pdf format here. Mitchell, Sara McLaughlin, Kelly M. Kadera, and Mark J.C. Crescenzi. 2008. Mitchell, Sara McLaughlin, Kelly M. Kadera, and Mark J.C. Crescenzi. "Practicing Democratic Community Norms: Third Party Conflict Management and Successful Settlements", in Jacob Bercovitch and Scott Sigmund Gartner (eds. ), International Conflict Mediation: New Approaches and Findings. Routledge. Download the paper in pdf format here. Hensel, Paul R., Sara McLaughlin Mitchell, Thomas E. Sowers II, and Clayton L. Thyne. 2008. "Bones of Contention: Comparing Territorial, Maritime, and River Issues." Journal of Conflict Resolution, 52(1): 117-143. You can download the paper here, and the replication dataset and web appendix on Paul Hensel's website here. Hansen, Holley, Sara McLaughlin Mitchell, and Stephen C. Nemeth. 2008. 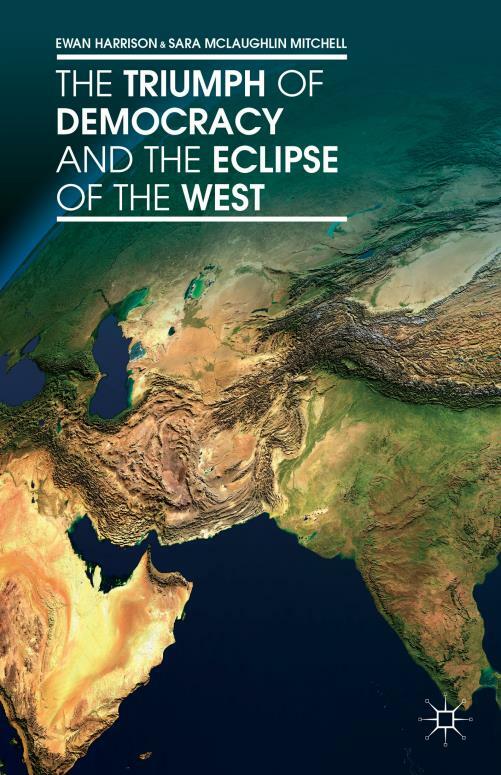 "IO Mediation of Interstate Conflicts: Moving Beyond the Global vs. Regional Dichotomy." Journal of Conflict Resolution, 52(2): 295-325. You can download the paper in pdf format here. Mitchell, Sara McLaughlin and Paul R. Hensel. 2007. "International Institutions and Compliance with Agreements." American Journal of Political Science 51(4):721-737. You can download the paper in pdf format here and access the web appendix here. Also visit our ICOW webpage at www.icow.org. Powell, Emilia Justyna and Sara McLaughlin Mitchell. 2007. "The International Court of Justice and the World's Three Legal Systems." Journal of Politics 69(2):397-415. You can download the paper in pdf format here and the online appendix here. Hensel, Paul R., Sara McLaughlin Mitchell, and Thomas E. Sowers II. 2006. "Conflict Management of Riparian Disputes." Political Geography, 25(4): 383-411. You can download the paper in pdf format here. Hensel, Paul R. and Sara McLaughlin Mitchell. 2005. "Issue Indivisibility and Territorial Claims." GeoJournal 64(4): 275-285. You can download the paper in pdf format here. Kadera, Kelly M. and Sara McLaughlin Mitchell. 2005. "Heeding Ray's Advice: An Exegesis on Control Variables in Systemic Democratic Peace Research." Conflict Management and Peace Science, 22(4): 311-326. You can download the paper in pdf format here. Mitchell, Sara McLaughlin and Brandon C. Prins. 2004. "Rivalry and Diversionary Uses of Force." Journal of Conflict Resolution, 48(6):937-961. You can download the paper in pdf format here. A replication dataset in zipped format is available, along with documentation. Mitchell, Sara McLaughlin. 2002. "A Kantian System? Democracy and Third Party Conflict Resolution." American Journal of Political Science, 46(4):749-759. You can download the paper in pdf format here. You can download the files for replication here. Leeds, Brett Ashley, Jeffrey M. Ritter, Sara McLaughlin Mitchell, and Andrew G. Long. 2002. "Alliance Treaty Obligations and Provisions, 1815-1944." International Interactions, 28(3): 237-260. This paper describes the data collected by the ATOP data and replicates a recent alliance study by Lai and Reiter (2000). You can download the paper in pdf format here. Data for replication can be found here. Leeds, Brett Ashley, Andrew G. Long, and Sara McLaughlin Mitchell. 2000. "Reevaluating Alliance Reliability: Specific Threats, Specific Promises." Journal of Conflict Resolution, 44(5): 686-699. You can download the paper in pdf format here. Data for replication can be found here. Mitchell, Sara McLaughlin and Will H. Moore. 2000. "Presidential Uses of Force During the Cold War: Aggregation, Truncation, and Temporal Dynamics." American Journal of Political Science. 46(2): 438-452. You can download the paper at the following website and find a link to our replication dataset. Mitchell, Sara McLaughlin and Brandon Prins. 1999. Beyond Territorial Contiguity: Issues at Stake in Democratic Militarized Disputes. International Studies Quarterly, 43(1): 169-183. Mitchell, Sara McLaughlin, Scott Gates, and Havard Hegre. 1999. "Evolution in Democracy-War Dynamics." Journal of Conflict Resolution , 43(6): 771-792. Download a copy of the paper in PDF format here. McLaughlin, Sara; Scott Gates; Havard Hegre; Nils Petter Gleditsch; and Ranveig Gissinger. 1998. "Timing the Changes in Political Structures." Journal of Conflict Resolution, 42(2):231-42. A link to the paper and dataset is provided below under the Datasets section. "Patterns of Maritime Conflicts, 1900-2010: The Onset and Management of ICOW Maritime Claims. "> Paper available here. Could the new fighting between Russia and Ukraine escalate into all-out war?. Washington Post, Monkey Cage. December 5, 2018. Guest on River to River, Iowa Public Radio. Appearances on 8/23/2017, 12/22/2017, and 2/15/2018. Iowa Public Radio, Patterns of Maritime Conflicts, 1900-2010. December 22, 2017. Patterns of Maritime Conflicts, 1900-2010. Presentation to the Iowa City Foreign Relations Council, November 2017. Relations International: The Importance of Water (In)Security". March 23, 2017. Relations International: Embracing our Failures". May 25, 2016. Foreign Policy: "How To Get Tenure (If You're a Woman)", coauthored with Erica Chenoweth, Page Fortna, Burcu Savun, Jessica Weeks, and Kathleen Cunningham. April 19, 2016. Des Moines Register: "Why Voting for a Female President Matters",, January 22, 2016. Piracy-Studies.Org: "Strategies for Resolving Maritime Disputes: Privatization vs. Institutionalization (with Stephen Nemeth)", February 3, 2015. Washington Post: The Monkey Cage: "Why It Matters That More Women Present at Conferences", October 2, 2013. Duck of Minerva, Part II: "The Glass Half Full: Gendered Progress in Academic Networking", August 27, 2013. Duck of Minerva, Part I: "The Glass Half Empty: Gendered Networking Problems in Academic Networking", August 24, 2013. I am currently working with Paul Hensel on the collection of issue claim data for territorial, maritime, and river claims. Please visit our ICOW website. I previously worked with Brett Ashley Leeds on the coding of ATOP data from 1816-1944. Please visit the ATOP website to download datasets and obtain more information . In 1997-1998, I worked on coding for the Polity 3D Data, which is an expansion of the Polity III data that gives the exact timing of polity changes, rather than relying on yearly reports; the preceding link downloads a zipped file including the data and documentation in multiple formats. You can download the article here. You can download the data, source notes, codebook, the original Polity II codebook, and memo on coding sources.